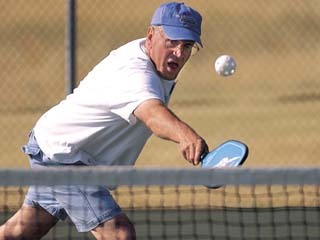 Pickleball is a racquet sport that combines the elements of badminton, tennis and table tennis. The game is played on tennis courts with a wooden paddle and perforated plastic ball, similar to a whiffle ball. The game is simple to learn, but can be developed into a quick, fast-paced competitive game. This is a great activity for adults through seniors! Burke Park tennis courts are reserved for pickleball games on Wednesday's from 4:30-6:30 p.m. and Saturday's, from 9:00-11:00am throughout the warm weather season.